For the 1999 film, see Molokai: The Story of Father Damien. Molokaʻi (/ˌmoʊləˈkaɪ, -ˈkɑːi, ˈmɒlə-/; Hawaiian: [ˈmoloˈkɐʔi]), nicknamed “The Friendly Isle”, is the fifth largest island of eight major islands that make up the Hawaiian Island Chain in the middle of the Pacific Ocean. 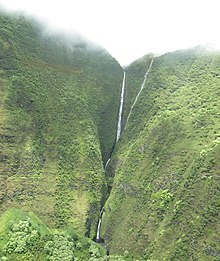 It is 38 by 10 miles (61 by 16 km) in size at its extreme length and width with a usable land area of 260 square miles (673.40 km2), making it the fifth-largest of the main Hawaiian Islands and the 27th largest island in the United States. It lies east of Oʻahu across the 25-mile (40 km) wide Kaiwi Channel and north of Lānaʻi, separated from it by the Kalohi Channel. The island has been known both for developments by Molokaʻi Ranch on much of the island, for pineapple production, cattle ranching and tourism. Residents or visitors to the west end of Molokaʻi can see the lights of Honolulu on Oʻahu at night; they can view nearby Lānaʻi and Maui from anywhere along the south shore of the island. In Kalawao County, on the Kalaupapa Peninsula on the north coast, settlements were established in 1866 for quarantined treatment of persons with leprosy; these operated until 1969. The Kalaupapa National Historical Park now preserves this entire county and area. Molokaʻi developed from two distinct shield volcanoes known as East Molokaʻi and the much smaller West Molokaʻi. The highest point is Kamakou on East Molokaʻi, at 4,970 feet (1,510 m). Today, East Molokaʻi volcano, like the Koʻolau Range on Oʻahu, is what remains of the southern half of the original mountain. The northern half suffered a catastrophic collapse about 1.5 million years ago and now lies as a debris field scattered northward across the bottom of the Pacific Ocean. What remains of the volcano on the island include the highest sea cliffs in the world. The south shore of Molokaʻi boasts the longest fringing reef in the U.S. and its holdings—nearly 25 miles (40 km) long. Molokaʻi is part of the state of Hawaiʻi and located in Maui County, except for the Kalaupapa Peninsula, which is separately administered as Kalawao County. Maui County encompasses Maui, Lānaʻi, and Kahoʻolawe in addition to Molokaʻi. The largest town on the island is Kaunakakai, which is one of two small ports on the island. Molokaʻi Airport is located on West Molokaʻi. The United States Census Bureau divides the island into three census tracts: Census Tract 317 and Census Tract 318 of Maui County, Hawaiʻi, and Census Tract 319 of Kalawao County, Hawaiʻi. The total 2010 census population of these was 7,345, living on a land area of 260.02 square miles (673.45 km2). Molokaʻi is separated from Oʻahu on the west by the Kaiwi Channel, from Maui on the southeast by the Pailolo Channel, and from Lānaʻi on the south by the Kalohi Channel. Molokaʻi is split into two main geographical areas. The low western half is very dry and the soil is heavily denuded due to poor land management practices, which allowed over-grazing by goats. It lacks significant ground cover and virtually the entire section is covered in non-native kiawe (Prosopis pallida) trees. One of the few natural areas remaining almost intact are the coastal dunes of Moʻomomi, which are part of a Nature Conservancy preserve. The eastern half of the island is a high plateau rising up to an elevation of 4,900 ft (1,500 m) on Kamakou peak and includes the 2,774 acres (11.23 km2; 4.334 sq mi) Molokaʻi Forest Reserve. The eastern half is covered with lush wet forests that get more than 300 in (7,600 mm) of rain per year. The high-elevation forests are populated by native ʻōhiʻa lehua (Metrosideros polymorpha) trees and an extremely diverse endemic flora and fauna in the understory. Much of the summit area is protected by the Nature Conservancy's Kamakou and Pelekunu valley preserves. Below 4,000 feet (1,200 m), the vegetation is dominated by exotic flora, including strawberry guava (Psidium littorale), eucalyptus (Eucalyptus spp. ), and cypress (Cupressus spp.). Introduced axis deer (Axis axis) and feral pigs (Sus scrofa) roam native forests, destroying native plants, expanding exotic plants through disturbance and distribution of their seeds, and threatening endemic insects. Near the summit of Kamakou is the unique Pepepae bog, where dwarf ʻōhiʻa and other plants cover the soggy ground. Molokaʻi is home to a great number of endemic plant and animal species. However, many of its species, including the olomaʻo (Myadestes lanaiensis), kākāwahie (Paroreomyza flammea), and the Bishop's ‘ō‘ō (Moho bishopi) have become extinct. Molokaʻi is home to a wingless fly among many other endemic insects. It used to be thought that Molokaʻi was first settled around AD 650 by indigenous peoples most likely from the Marquesas Islands. However, a 2010 study using revised, high-precision radiocarbon dating based on more reliable samples has established that the period of eastern Polynesian colonization of the Marquesas Islands took place much later, in a shorter time frame of two waves: the "earliest in the Society Islands c. 1025–1120, four centuries later than previously assumed; then after 70–265 years, dispersal continued in one major pulse to all remaining islands c. 1190–1290." Later migrants likely came from Tahiti and other south Pacific islands. Although Captain James Cook recorded sighting Molokaʻi in 1778, the first European sailor to visit the island was Captain George Dixon of the British Royal Navy in 1786. The first significant European influence came in 1832 when a Protestant mission was established at Kaluaʻaha on the East End of the island by Reverend Harvey Hitchcock. The first farmer on Molokaʻi to grow, produce and mill sugar and coffee commercially was Rudolph Wilhelm Meyer, an immigrant from Germany who arrived in 1850. He built the first and only sugar mill on the island in 1878, which is now a museum. Ranching began on Molokaʻi in the first half of the 19th century when King Kamehameha V set up a country estate on the island, which was managed by Meyer and became what is now the Molokaʻi Ranch. In the late 1800s, Kamehameha V built a vacation home in Kaunakakai and ordered the planting of over 1,000 coconut trees in Kapuaiwa Coconut Grove. Leprosy (also known as Hansen's disease) was among Eurasian diseases introduced to the Hawaiian islands by traders, sailors, workers and others who lived in societies where these diseases were endemic. Because of the islanders' lack of immunity to the new diseases, they suffered high rates of infection and death from smallpox, cholera and whooping cough, as well as leprosy. Sugar planters were worried about the effects on their labor force and pressured the government to take action to control the spread of leprosy. The legislature passed a control act requiring quarantine of people with leprosy. The government established Kalawao located on the isolated Kalaupapa peninsula on the northern side of Molokaʻi, followed by Kalaupapa as the sites of a leper colony that operated from 1866 to 1969. Because Kalaupapa had a better climate and sea access, it developed as the main community. A research hospital was developed at Kalawao. The population of these settlements reached a peak of 1100 shortly after the beginning of the 20th century. In total over the decades, more than 8500 men, women and children living throughout the Hawaiian islands and diagnosed with leprosy were exiled to the colony by the Hawaiian government and legally declared dead. This public health measure was continued after the Kingdom became a U.S. territory. Patients were not allowed to leave the settlement nor have visitors and had to live out their days here. In the 21st century, there are no persons on the island with active cases of leprosy, which has been controlled through medication, but some former patients chose to continue to live in the settlement after its official closure. Pater Damiaan de Veuster, a Flemish priest of the Congregation of the Sacred Hearts of Jesus and Mary served as a missionary for 16 years in the communities of sufferers of leprosy. Joseph Dutton, who served in the 13th Wisconsin Volunteer Infantry Regiment during the American Civil War and converted to Roman Catholicism in 1883, came to Molokaʻi in 1886 to help Pater Damiaan and the rest of the population who suffered from leprosy. Pater Damiaan died at Kalaupapa in 1889 while Joseph Dutton died in Honolulu in 1931 at the age of 87. Mother Marianne Cope of the Sisters of Saint Francis of Syracuse, New York, brought six of her Sisters to work in Hawaiʻi with leprosy sufferers in the late 19th century, also serving on Molokaʻi. Both Father Damiaan and Mother Marianne have been canonized as Saints by the Roman Catholic Church for their charitable work and devotion to sufferers of leprosy. In December 2015, the cause of Joseph Dutton was formally opened, obtaining him the title Servant of God. Over the years the Ranch company has also acted as a developer, establishing hotels and related amenities for resort tourists on their property and over the same period of time has seen protests and activities by community activists such as fence cutting and poisoning of the Ranch’s exotic African Safari animals in 1994, an arson attack on a recently renovated Ranch house at Kaupoa in 1995 or the destruction of five miles of Ranch water pipes in 1996. In 2007 community residents organized the "Save Laʻau Point" movement to oppose Molokaʻi Ranch's attempt to expand its resort operation. As a result, on March 24, 2008, Molokaʻi Ranch, then the island's largest employer, decided to shut down all resort operations, including hotels, movie theater, restaurants, and golf course, and dismiss 120 workers. In September 2017 the company that owns Molokaʻi Ranch, Singapore-based Guoco Leisure Ltd, put this 55,575 acre property, encompassing 35% of the island of Molokaʻi, on the market for $260 million. 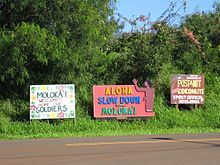 Because of its rural, agricultural nature, Molokaʻi has Hawaiʻi's highest unemployment rate. One third of its residents use food stamps. As of 2014[update], the largest industry on the island is seed production for Monsanto and Mycogen Seeds, including GMO seeds. The tourism industry on Molokaʻi is relatively small, compared to the other islands in Hawaiʻi. Only 64,767 tourists visited Molokaʻi in 2015. For years, residents of Molokaʻi have resisted private developers' attempts to dramatically increase tourism. Accommodations are limited; as of 2014, only one hotel was open on the island. Most tourists find lodgings at rental condos and houses. National Geographic Traveler magazine and the National Geographic Center for Sustainable Destinations conduct annual Destination Scorecard surveys, aided by George Washington University. In 2007, a panel of 522 experts in sustainable tourism and destination stewardship reviewed 111 selected human-inhabited islands and archipelagos around the world. Molokaʻi ranked 10th among the 111 destination locales. The survey cited Molokaʻi's pristine, breathtaking tropical landscape; environmental stewardship; rich and deep Hawaiian traditions (the island's mana); and visitor-friendly culture. The neighbor islands of Hawaiʻi, Kauaʻi, Maui and Oʻahu, ranked 50, 61, 81 and 104, respectively. Molokaʻi is believed to be the birthplace of the hula. The annual Molokaʻ Ka Hula Piko festival is held on this island. Molokaʻi can be reached by plane. Planes fly into Molokaʻi daily from other Hawaiian islands including Oʻahu (Honolulu and Kalaeloa), Maui (Kahului) and Hawaiʻi (Kona) on Mokulele Airlines, Makani Kai Air, Paragon Air and Hawaiian Airlines. A ferry that formerly sailed between Molokaʻi and Lāhainā Harbor, Maui closed operations on October 27, 2016. Sea Link President and Senior Capt. Dave Jung attributed the closure to competition from federally subsidized commuter air travel and declining ridership. The island of Molokaʻi is served by Molokaʻi General Hospital, which operates all day, every day. It is also serviced by Molokaʻi Community Health Center, Molokaʻi Family Health Center, and Dr. Daniel McGuire, MD. The island public school system includes 4 elementary schools, one middle school and one high school. There is also a community college. The island has one private middle/high school. The island contains many parks and other protected areas, including Palaʻau State Park, Kiowea Beach Park, Kakahaia National Wildlife Refuge, Molokaʻi Forest Reserve, Pelekunu Preserve, George Murphy Beach Park, Halawa Beach Park, and Papohaku Beach Park (3 miles of pristine beach) in the portion within Maui County. 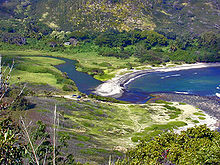 Today Kalawao County is preserved by the Kalaupapa National Historical Park (accessible by guided mule or hiking tour). The island can be traversed by a single lane highway running east to west (highways 450 and 460). Highway 470 is a spur up to the barrier mountains of Kalawao County and the Kalaupapa peninsula. By land this area (Kalaupapa) can only be reached by mule and hiking trails. Most access to the Kalaupapa peninsula is by sea. Maui Economic Opportunity operates public transportation on Molokaʻi. ^ "Molokai Shows Population Decline Over the Past Decade". ^ "the definition of Molokai". Dictionary.com. ^ "Table 5.08 - Land Area of Islands: 2000" (PDF). 2004 State of Hawaii Data Book. State of Hawaii. 2004. Retrieved 2007-07-23. ^ "Table 5.11 - Elevations of Major Summits" (PDF). 2004 State of Hawaii Data Book. State of Hawaii. 2004. Retrieved 2007-07-23. ^ "Submarine volcanoes - MBARI". www.mbari.org. ^ Culliney, John L. (2006) Islands in a Far Sea: The Fate of Nature in Hawaii. Honolulu: University of Hawaii Press. p. 17. ^ "Resident Population of Islands 1960 to 2010" (PDF). ^ "Division of Forestry and Wildlife". Division of Forestry and Wildlife. ^ Janet M. Wilmshurst; Terry L. Hunt; Carl P. Lipo; Atholl J. Anderson. "High-precision radiocarbon dating shows recent and rapid initial human colonization of East Polynesia". PNAS. 108 (5): 1815–20. doi:10.1073/pnas.1015876108. PMC 3033267. PMID 21187404. Retrieved 26 October 2015. ^ Meyer Sugar Hookuleana LLC 2013. Retrieved 10 July 2017. ^ "Kalaupapa National Historical Park - Hansen's Disease Patients at Kalawao and Kalaupapa (U.S. National Park Service)." U.S. National Park Service - Experience Your America. Web. 19 Nov. 2009. ^ "Kalaupapa, Molokai, Hawaii - Father Damien". VisitMolokai.com web site. Retrieved 2009-09-29. ^ Molokai Ranch: Protesters to Cash in with Takeover Plan? Hawai'i Free Press, 22 March 2008. Retrieved 10 September 2017. ^ Molokai Ranch Timeline Honolulu Advertiser, 26 March 2008. Retrieved 11 September 2017. ^ Star-Bulletin, Honolulu. "starbulletin.com - Business - /2007/01/14/". archives.starbulletin.com. ^ Hawaii's Molokai Ranch on the market for $260M Pacific Business News, 7 September 2017. Retrieved 9 September 2017. ^ a b "Molokai has the Most to Lose but the Least Say in the GMO Debate". ^ Visitor Statistics Hawaii Tourism Authority. Retrieved 16 June 2017. ^ Tourtellot, Jonathan B. (November–December 2007). "Destinations Rated: Islands" (PDF). National Geographic Traveler: 108–127. ^ Ferry service ended Honolulu Star Advertiser. Retrieved 16 June 2017. ^ "Kalaupapa National Historic Park". ^ "Papohaku Beach Park". Go Hawaii. ^ "Transportation Services, Schedules & Applications". Retrieved 2018-12-02. ^ Daws, Gavan (1984). Holy Man: Father Damien of Molokai. University of Hawaii Press. pp. 89–92. ISBN 978-0-8248-0920-1. Coffman, Tom (2003). The Island Edge of America: A Political History of Hawai'i. University of Hawaii Press. ISBN 978-0-8248-2662-8. Farber, Joseph M. (1997). Ancient Hawaiian Fishponds: Can Restoration Succeed on Molokaʻi?. Neptune House Publications. ISBN 978-0-9659782-0-0. Lee, Pali Jae Kealohilani (1984). Moʻolelo O Na Po Makole. Paia-Kapela-Willis, ʻOhana. Lo, Catharine. "On the Rocks". Hana Hou!. 9 (6). Article about Hawaiian limpets, a traditional delicacy known locally as ʻopihi. Tayman, John (11 May 2010). The Colony: The Harrowing True Story of the Exiles of Molokai. Simon and Schuster. ISBN 978-1-4165-5192-8. Starbird, Ethel A. (August 1981). "Molokai—Forgotten Hawaii". National Geographic. Vol. 160 no. 2. pp. 188–219. ISSN 0027-9358. OCLC 643483454. Wikimedia Commons has media related to Molokaʻi.